Quail, cows and pigs, oh my! 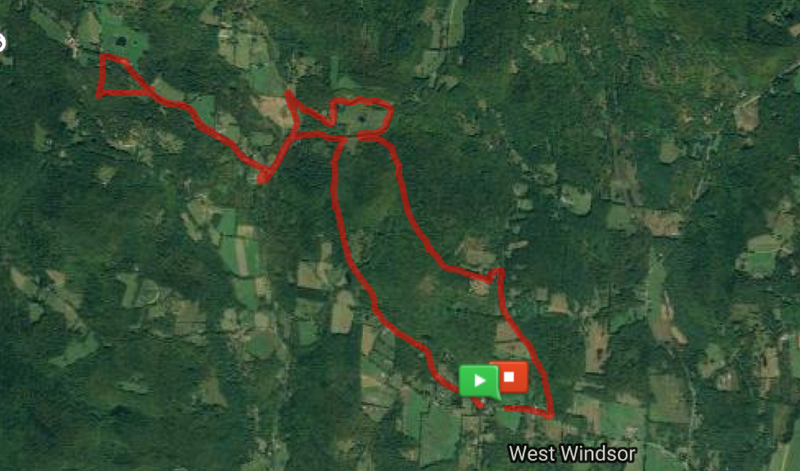 This ride had a few surprises on it — some good (beautiful trails) and some a bit scary (a few new animals). Years ago, there was a woman at our barn who said she couldn’t ride her horse on trails she didn’t know because he got too nervous. I’ve never really understood that because a good part of the fun of trail riding is moseying around and exploring. To always know where you’re going would defeat the purpose! Riding with someone who knows the local trails is a treat. This cute little Morgan has just ended a show career and this was his second time out on the trails. Zelda is so much bigger than he is — we looked like Mutt and Jeff. Zelda is brave. It’s nice to have a horse that will hack out on strange trails and keep her senses. We started out our ride today with the woman who owns the barn where Zelda is staying. She took us on some lovely trails that are not marked on the map. It’s a real plus to ride with someone local because I would never dream of riding up someone’s driveway and it’s a treat to find a beautiful field at the end of it. I’d planned on a shorter ride today, maybe around 6 miles but we ended up doing a bit over nine because it was such a beautiful day and Zelda seemed game. Her fitness level is already improving — not nearly so much huffing and puffing up the hills. Lots of walking is really getting her into shape. 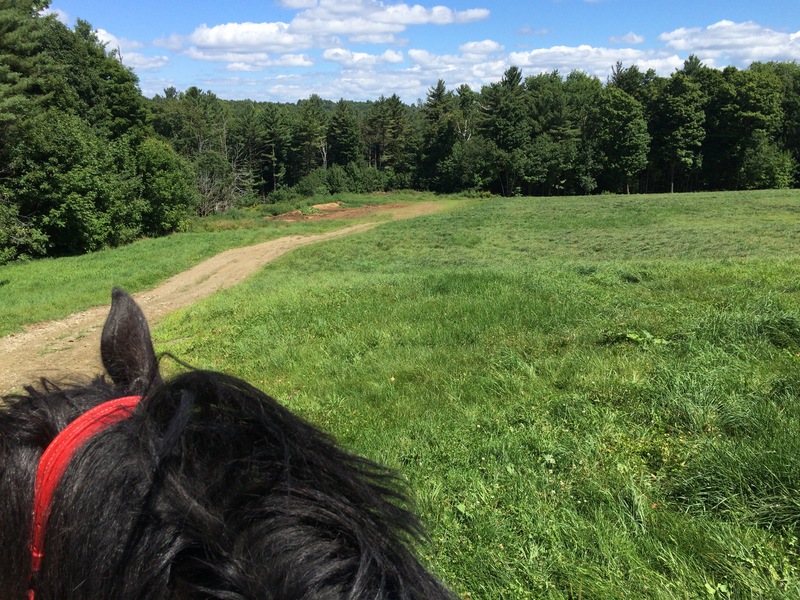 After we left our tour guide (I wanted to ride a bit further), Zelda and I rode up some of the small dirt roads. Some of the trails I remembered from our vacations up here ten years ago are now closed off, reserved for special rides. I can understand that land owners are reluctant to have people riding through their property all the time but it does mean more riding on the roads. And a few unexpected encounters with the local population of farm animals. Another beautiful field! 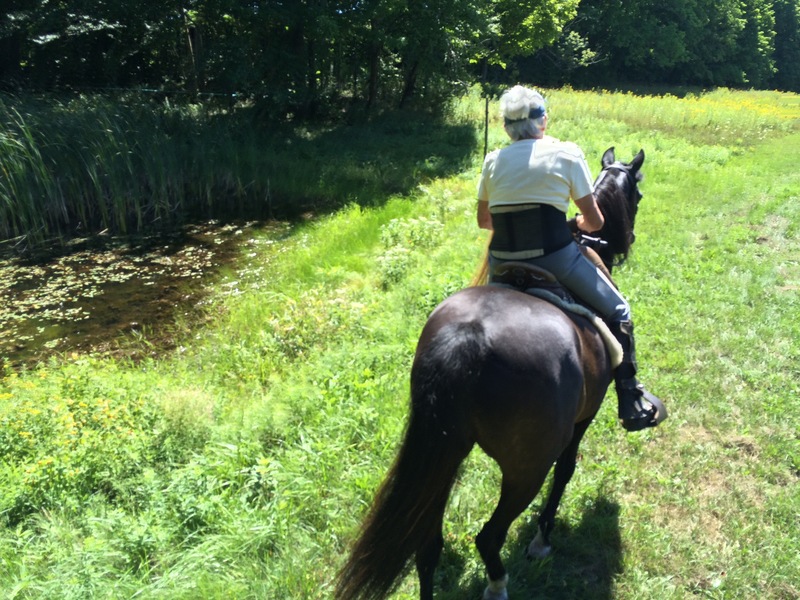 We had such great weather for ridingAnd that sometimes leads to unexpected encounters with the local wildlife. On this ride, Zelda’s bravery was tested. First, we ran into a flock of pheasants or quails. There were about seven of them, scurrying to and fro across a very rustic road. I was glad I wasn’t riding Freedom as he has a fear of wild turkeys that is beyond reason (best I can guess, he thinks they are one large animal with multiple heads and many legs). Those little guys stopped Zelda in her tracks and we had to wait for them to disappear into the forest before she would proceed. Then, there were the cows. Lots of cows. We’d managed to pass the cows on Wednesday without incident, but without her friends, Zelda balked. Even worse, the cows were on both sides of the road. As far as she was concerned, the safest route was backwards. And fast. I decided not to press the point as I wasn’t sure we were on the right route and I didn’t want to turn around and go by them again if I didn’t have to. What neither of us had seen on the way out, however, were the pigs. Two of them. There is nothing like discovering your first pigs when riding down a very steep Vermont hill, but we survived. Luckily, the rest of the way back was uneventful! Zelda enjoyed a good roll after most of our rides. 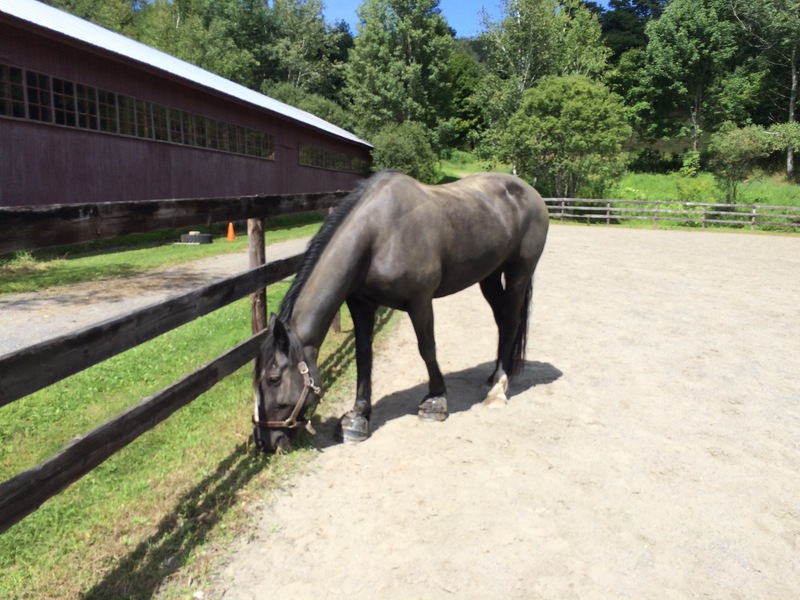 I was lucky that the barn was able to turn her out in their ring so she didn’t have to stay in her stall. Definitely broadened Zelda’s horizons. And yes, the trails there are amazing. It makes you feel mentally refreshed (physically tired) to take it all in.